Motorists drive past a sign advertising regular gasoline at $1.88 per gallon at a station in Longmont, Colo., on Dec. 22, 2018. Falling gasoline prices have given drivers a little extra cheer this winter. Gas is relatively cheap these days. Enjoy those low prices, but don't get used to them, analysts say. An oversupply of oil on the world market has triggered a steady slide in gas prices, bringing Americans some of the cheapest gas in years as 2019 kicked off. Nationally, regular was averaging around $2.25 per gallon at the start of January — the lowest price for this time of year since 2016, according to AAA. It's welcome news for drivers. Just last summer, gas prices were at four-year highs. But recently, at a Costco gas station in Washington, D.C., Sylvie Tiadem was delighted that it cost her only $26 to fill up. "Oh, my goodness!" she said. That's down from the nearly $40 it cost her when gas prices were higher. "Expenses are growing everywhere, but when one goes down, I'm happy," Tiadem said. Gas prices vary across the country. They're cheaper in the South and pricier in the West, according to AAA's data. But in general, drivers like Tiadem have been happy for months now. "We started to see prices decrease in October, and they came down slowly but consistently since then," says Jeanette Casselano, a spokeswoman for AAA. "It still has a lot to do with where you are, but regardless, gas prices are cheaper than we've seen them in 2018." Multiple factors affect the price of gasoline — primarily taxes, distribution, refining and the price of crude oil, the raw material used to make gas. In this case, the reason for the price drop is clear: It's driven by a drop in the price of oil, says Kelsey Hallahan, a petroleum markets analyst with the Energy Information Administration. Prices for crude oil, which accounts for more than half of the final price a consumer pays for gasoline, fell dramatically in October. Earlier in the year, Saudi Arabia and Russia were working together to cut production and send oil prices higher. But then they changed course. Among other things, President Trump pressured Saudi Arabia to hold steady on oil production, out of concern that sanctions on Iran would cause Tehran to retaliate by trimming output, then cutting into global supply. And when the Iran sanctions were effectively delayed, global oil supplies kept edging higher. Global demand was not keeping pace — especially as the Chinese economy shows signs of slowing. American suppliers, meanwhile, kept pumping out more and more oil, particularly over the past three years. Oil prices were high enough that it was worthwhile to extract oil that's difficult and expensive to get out of the ground, Hallahan says. But then that increase in U.S. production contributed to the oversupply, helping drive prices back down — a classic cycle in the oil industry. Lower oil prices are tough on producers, although Hallahan says American companies have been doing OK.
"U.S. producers have been incredibly resilient in the face of low oil prices, and we think that they're going to continue to be resilient in the next year and we're going to continue to see U.S. production grow," she says. But the resulting drop in gas prices makes consumers happy. It means more money directly in more people's pockets — and the difference is particularly significant for those considered middle class and low income, who plunk down a larger chunk of their disposable income on fuel costs. Scott L. Montgomery, an author and affiliate faculty member at the University of Washington who specializes in energy, says gas prices have a huge psychological impact. "We have to remember that the price of gasoline is on very large signs everywhere we drive," he says. "So it is the price that sticks in consumers' minds." At the same time, a drop in gas prices can have larger consequences for society, because it influences the kinds of choices drivers make when buying new cars. When gas prices are low, people are less motivated to cut back on driving or to seek out smaller, more fuel-efficient vehicles — which, in turn, makes it harder for the U.S. to reduce its greenhouse gas emissions and curb its contribution to climate change. "People really react very quickly to this," Montgomery says. "They believe that they're saving a lot more money than they actually are. And so they will buy more SUVs or bigger cars." But don't count on gas prices staying low. Oil prices have started to rise again. OPEC and Russia are planning to curb production to get prices higher. Hallahan, the petroleum analyst, has a simple prediction: "We're expecting that gasoline prices will go up in 2019, because we expect crude oil prices to also rise." All right, if one of your New Year's resolutions was to spend less money, you might be getting a little help right now from really low gas prices - so low, maybe you don't even want to jinx it by asking why the gas prices are low. But NPR's Camila Domonoske is going to tell us. CAMILA DOMONOSKE, BYLINE: At the Costco in Washington, D.C., gas is going for $2.05 a gallon. And Sylvie Tiadem is pumped. SYLVIE TIADEM: You see, $26, oh, my goodness. DOMONOSKE: She says she was paying nearly 40 bucks to fill up her sedan back when gas prices were higher. TIADEM: Twenty-six dollars, I'll take it any day. Expenses are growing everywhere. But when one goes down, I'm happy. DOMONOSKE: Gas prices vary across the country. They're cheaper in the South and higher in the West. But in general, drivers like to Tiadem have been happy for months now. JEANETTE CASSELANO: Gas prices are cheap. That's the headline, and that's the good news for consumers. DOMONOSKE: Jeanette Casselano is a spokeswoman for AAA. CASSELANO: We started to see prices decrease in October. And they came down slowly but consistently since then. We started this year at $2.25, which is the cheapest price we've seen at the start of January in three or four years. DOMONOSKE: This week, gas is selling for less than 2 bucks a gallon at more than a third of the country's gas stations. 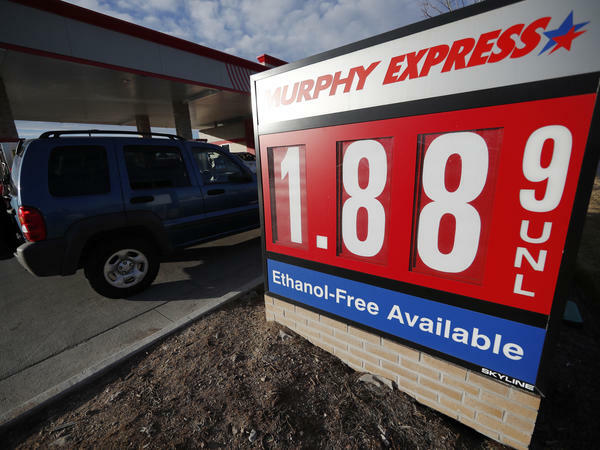 Gas is cheap because of a dramatic drop in crude oil prices that started in October. Kelsey Hallahan is with the Energy Information Administration. KELSEY HALLAHAN: Crude oil is responsible for about just over 50 percent of gasoline prices. And when crude oil prices fall, we also see a fall in gasoline prices. DOMONOSKE: And those crude prices fell because there's a global glut in oil. Saudi Arabia boosted production under pressure from President Trump. Meanwhile, America has become the largest producer of oil. And U.S. companies have been pumping more and more. Demand is not keeping pace. The world just doesn't need as much oil as it's been making. So why were American companies producing so much? HALLAHAN: Largely, we think it's due to crude prices. DOMONOSKE: Back to prices. Crude is cheaper now. But before October, oil companies were seeing dollar signs. Higher prices motivated them to get more oil out of the ground. Then all the new supply pushed prices back down. Now these lower prices put oil companies in a tougher position, although analysts say U.S. companies are handling the price drop OK. And it makes consumers very happy. It's more money in people's pockets. That's especially important for middle-class and low-income people who put a bigger chunk of their disposable income toward fuel costs. Scott L. Montgomery is an author and affiliate faculty member at the University of Washington. He says gas prices have a huge psychological impact. SCOTT L. MONTGOMERY: We have to remember that the price of gasoline is on very large signs everywhere we drive. And so it is the price that sticks in consumers' minds. DOMONOSKE: A change in gas prices also changes consumer behavior in a way that can be out of proportion to the actual shift in their finances, Montgomery says. MONTGOMERY: They believe that they're saving a lot more money than they actually are. And so they will buy more SUVs or bigger cars. DOMONOSKE: So low gas prices can have larger consequences for society. If people are less worried about fuel efficiency, they have less incentive to reduce their contribution to climate change. But if there's one constant when it comes to gas prices, it's that they're always moving. Saudi Arabia and other OPEC nations are cutting oil production now. And analysts predict an increase in gas prices this year as the global oil trade regains its balance. Camila Domonoske, NPR News. Transcript provided by NPR, Copyright NPR.